PORTABLE – This travel toddler bed folds simply for easy travelling, plus you can conveniently store some items inside. SAFE – The included soft bumpers help keep your child in the bed and off the floor. COZY – The bed features a durable outer material plus a soft cozy velour inside to create an attractive sleep environment for your little one. CONVENIENT – The mattress cover is machine washable, and it comes with a bonus washable fitted sheet to make your life easier. SIZE – The bed measures 25″ x 14.5″ x 27″ when folded,and 55″ x 26″ x 7″ when open. The bumpers are 7″ high on the outside, and 4.5″ high on the inside. 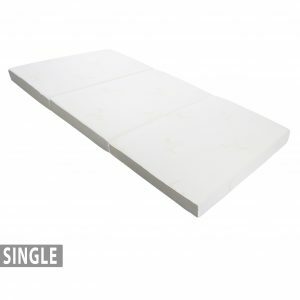 The mattress is 48″ x 20″. The Milliard Toddler Travel Bumper Bed is a soft safe spot for young kids to rest and relax. The inner plush velour material is waterproof, washable, and super cozy. We also included a bonus fitted sheet to make clean up that much more convenient! The bed folds easily and can be used for trips, sleepovers, a night in Mom’s room, and more. While in the folded position, it acts as a suitcase as well, and your child’s pj’s, blankie, pillow, and more can be stowed inside. The outer polka dot canvas material is durable, cute, and wipes clean. Safety comes first and all our foam is certified to be free of toxins and chemicals. We also designed the bed to be gap free with our unique Velcro flap closures so that little hands and toes don’t get caught. Spill? Accident? No worries! The mattress encasement is waterproof and easy to wash. Simply zip it off and throw it in the machine for a quick fix! This bed will help your toddler transition easily from his crib to a bed. It gives your child the independence and confidence he craves without compromising on your peace of mind. You can relax knowing your kid is safe in his cozy bumper bed. We included a bonus washable sheet to make your life even easier. Slip it on and off in a snap, it’s that easy!